Gloria C. (Mills) Goolsby obituary. Carnes Funeral Home. 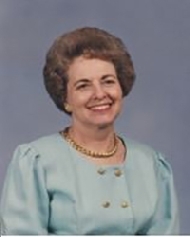 Gloria C. (Mills) Goolsby passed into the arms of her Lord and Savior on March 27, 2019. She was born in Miami, Florida on October 27, 1935. She is survived by her loving husband, James W. Goolsby, Son James W. Goolsby Jr. (Carrie), grandsons William Goolsby and Michael Goolsby, son-in-law David Watson, granddaughters Lara Watson and Emma Watson and sister, Charlotte Mills Hilliard of Jacksonville, FL. Gloria was preceded in death by her parents, C. Cary Mills, Dula B.Mills and daughter, Linda Goolsby Watson. Gloria was a long-time resident of Houston and Sugar Land, TX and graduated from the University of Houston, where she received her degree in Elementary Education. She taught elementary school in the Houston Independent School District for over 25 years. Jim was working in Jacksonville, FL after graduation from the University of Texas when he was introduced to Gloria by a fellow Employee. They were very much in love and were married in Jacksonville in 1958. The marriage has lasted for over 60 wonderful years, a very proud achievement. Gloria lived a life of service to others to honor her Lord and Savior and her warm and giving heart knew no bounds. She was very active in church work throughout her life, including at Sugar Land Methodist Church. Gloria was a member of the first class of Stephen Ministers and spent many years as a Stephen Minister leader. The Joy of Living bible study group was also one of her favorite activities and she always looked forward to Tuesday morning worship with her friends. Gloria also served as a Joy group leader for several years. She will be dearly missed by all of those who knew and loved her. The family would like to thank Dr. Ritsuko Komaki, Dr. Steven Yevich and the staff at MD Anderson Cancer Center for their tireless care and service. We are also most grateful for the love and support from the members of Sugar Land Methodist Church. A memorial service celebrating Gloria’s life will be held on March 30, 2019 at 11:00 AM at Sugar Land Methodist Church, 431 Eldridge Rd., Sugar Land, TX, 77478. In lieu of flowers, the family would suggest a donation to the Caring Forever Fund at Sugar Land Methodist Church, or the charity of your choice.